Cape Town - In what has become the norm the last couple of Formula 1 seasons, on-track racing action took a backseat to technical advancements and overcomplicated rules and regulations. But at the 2016 Japanese GP the opposite happened as drivers went for wheel-to-wheel racing and not one racer being certain of where they will finish. Despite his strong showing all weekend, even Nico Rosberg wasn’t assured of winning the race. The German started the race from pole position, but given his Mercedes team’s reliability gremlins of late, he had to tread carefully not to put his car under too much pressure. But Mercedes had more to celebrate as they clinched the 2016 Constructors championship with four races to spare. Red Bull Racing, having scored their first 1-2 finish in Malaysia a week ago since the 2013 Abu Dhabi GP, had a less than ideal weekend. Max Verstappen finished in second place, while team mate Daniel Ricciardo came home sixth. After winning the Japanese GP, Rosberg increased his championship lead over team mate Lewis Hamilton to 33 points. With 100 points left on offer, Rosberg could win his first championship at the Mexican GP on October 30. En route to his first win in Japan, Rosberg made the best possible start and managed the race, and his car, like a champ. The gap between himself and the drivers behind never dipped below the five second mark and it was always going to be a tough task for anyone to catch him. 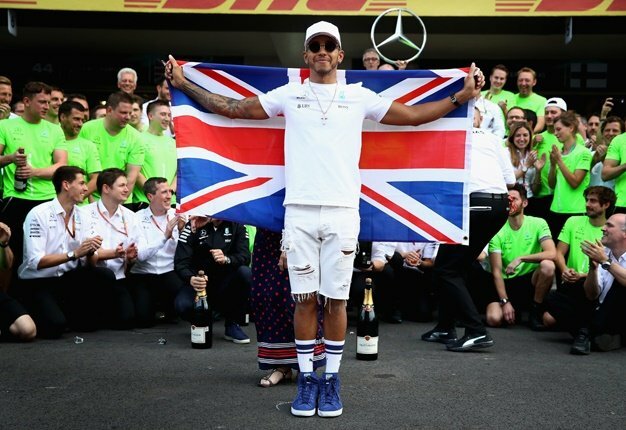 If he is to continue with his current form, it will be only a matter of time before he takes the title away from defending champion, Hamilton. For the umpteenth time this season, Hamilton flunked his race start and slipped down the order from second to eighth place. He had his work cut out for him as he fought through the field to finish in third place. For large chunks of the race Hamilton was stuck behind slower cars, including charging Ferrari’s, but thanks to strategists who do their jobs, he was able to use his pitstops to gain positions on other drivers. It was not enough to make up ground to Rosberg, as he is slipping further behind in the title race. With four races to go, Hamilton needs his wits about him if he is to take the fight to the season finale in Abu Dhabi. Sebastian Vettel and Kimi Raikkonen delivered stellar drives in their respective Ferrari cars to finish in fourth and fifth positions. Both drivers received penalties prior to the start of the race, but had a competitive edge about them that was missing throughout the season. Vettel raced within the top three positions for large parts of the race, while Raikkonen did battle with the likes of the Force Indias and Hamilton. The team is still chasing that elusive victory this season and with only a number of races left, it looks unlikely to happen. Still, with performances like this at least the tifosi will have something to be proud about. VIDEO: Double overtake from Iceman! 4 Proper racing for a change! The Japanese GP was a story of two halves. The first half saw exciting, nail-biting racing, but the second, after the racing got into a rhythm, saw much less. Still, there was more on-track overtakes than Hamilton sharing stories on SnapChat! Mercedes joined an elite group of F1 teams to clinch three or more championships in a row. The only other teams are Ferrari, Red Bull, McLaren and Williams. Ferrari is the only team to have achieved this feat twice. But the manner in which Mercedes went about chasing the crown is nothing short of greatness. With 17 of 21 races in 2016 complete, the German team has won 15 of them. And since 2014, when the new 1.6-litre V6 turbo-hybrid engine was introduced, the team amassed 47 victories out of 55 races - including the recently concluded Japanese GP. The team needed only to outscore Red Bull by 23 points to win the title and they did it in great fashion. Time for a Brackley and Brixworth sign off! !